Hello friends! 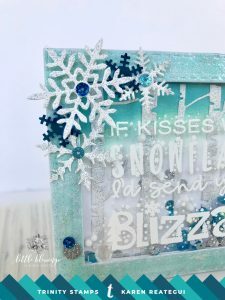 Today I’m up at Trinity Stamps blog showing a shaker card made with the Snowflake Kisses stamp and the Blizzard Shaker Embellishment Mix. 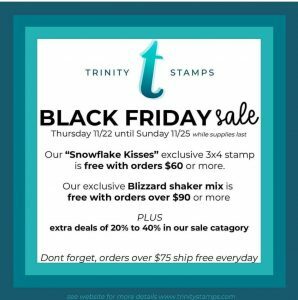 This stamp will be available only for Black Friday and you will get it free with your order over $60. 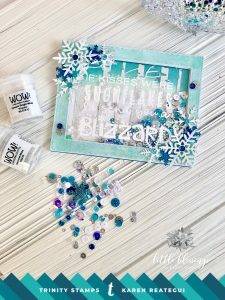 You can also get the Blizzard Shaker Embellishment Mix for free with orders over $90. Great deals, right? Let’s start! I cut an A2 white panel and added Peacock Feathers and Cracked Pistachio Distress Oxide inks to create the sky. 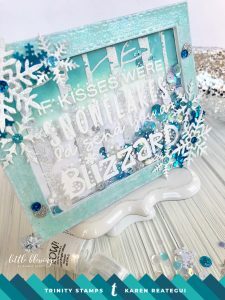 Then I die cut a forest background out of white cardstock and heat embossed it with WOW White Diamond embossing powder. I adhered this to my panel using glue dots. 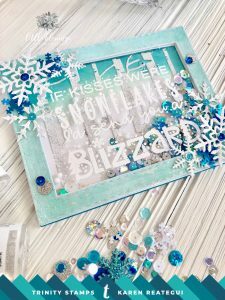 Next, using two rectangular dies I die cut eight times a frame. I glued seven of them on top of each other. I reserved frame number eight. I colored frame number eight using a BG000 Copic Sketch marker. 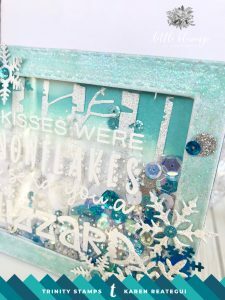 Then, in order to get a frosty look, I applied Clear Wink of Stella, Versamark ink and heat embossed it with clear sparkling embossing powder on top and reserved. I placed the seven stacked frames on top of the panel using foam tape. 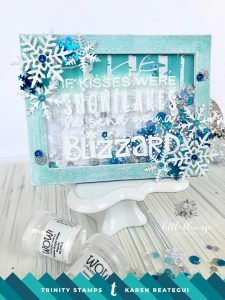 I added the Blizzard Shaker Embellishment Mix and some Flurries Seasonal Embellishment Mix inside the window frame. 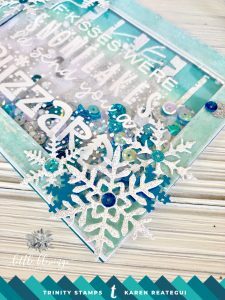 I stamped the sentiment onto acetate with Versamark ink and heat embossed it using WOW White Opaque embossing powder. I closed the window frame placing the acetate on top. 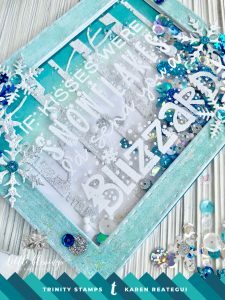 Finally, I added frame number eight to the panel and some snowflakes already embossed with WOW White Diamond embossing powder around the frame. Lastly, I also added some sequins and snowflakes from the Blizzard Shaker Embellishment Mix. Thank you so so much Amy!